Communicating with students and parents has never been more important than it is now. Security issues that school districts face to rising costs for traditional means of delivering information, edtech and digital signage for school district has become the answer to many of the issues. School districts now have the ability to create consistent system wide messaging viewable on screens, tablets and phones by all students, faculty and parents. Yet still allow for individualized school content and distribution while keeping an eye to the huge expense associated with communications for schools and edtech. The time and expense put into newsletters, flyers, multiple edtech platforms by the schools and school districts is a large part of the schools yearly expenses only to have them ignored or lost. When my children were school age, notifications would get buried in the bottom of a book bag or lost on the bus. Many times I would miss homework assignments or events because of lost paperwork or trying to track all of the edtech sites for teacher communications. There were numerous phone calls to the school for schedule updates. E-mails sent to teachers to learn about missed assignments or grades. All of these things take extra time by me and the school staff. Taking valuable teaching time away from educators to explain something that was sent through some other form of school communication. Digital signage for school districts streamlines the schools communications eliminating the need for costly printing and numerous edtech sites. 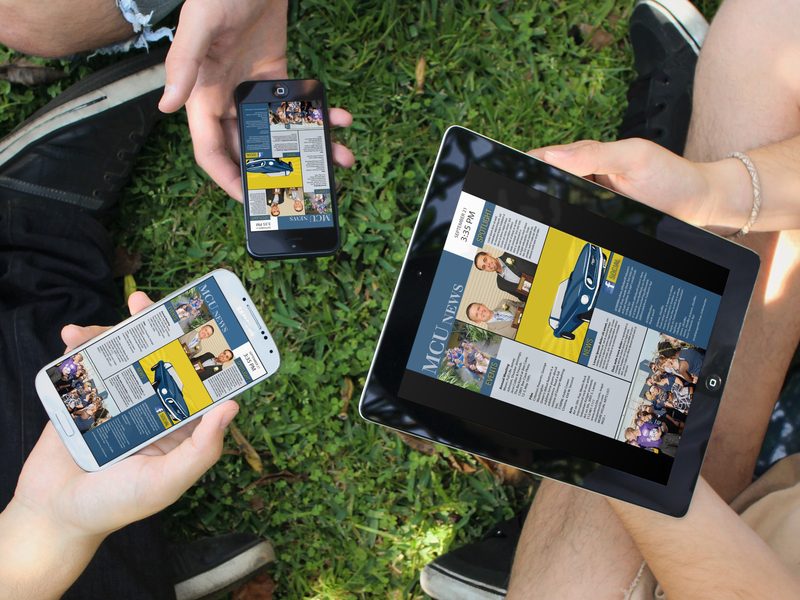 With Arreya Digital Signage Suite, parents and students away from the school can view the content on tablets and phones using the schools personal URL. With the use by schools and school districts of multiple forms of communications there was always inconsistencies between the information. Wrong dates and times were printed or typed into online sites. If not corrected, I would miss appointments for parent/teacher conferences, events or deadlines for turning in forms or have to double check by calling the school or emailing the teacher. When it came to district initiatives such as bond votes, new school planning or redistricting unless I watched the local news or subscribed to a newspaper I had no idea what was going on at that level. 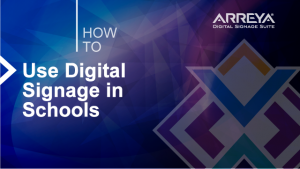 With Arreya Digital Signage Suite, numerous content managers can add content to the district wide school site and deploy to the entire school system or deploy to a single school. Corrections can be deployed in an instant, along with current information or changes to venues, events due to weather, or school schedules. My children’s grandparents live a great distance and couldn’t travel to my children’s events. When the school’s robotic program shared competitions through a online live streaming service, it was terrific. I could watch the competition even when I couldn’t be there and I could share the link with relatives so they could watch. 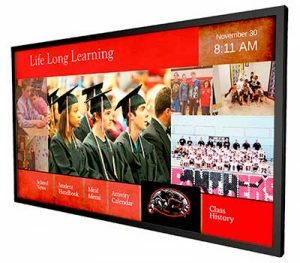 Digital Signage for school districts doesn’t have to confined to monitors in the buildings. 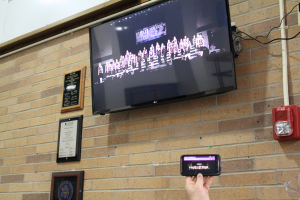 Arreya Digital Signage Suite, parents can keep up to date with school information or watch live stream events, just by bringing up the schools Arreya channel on their tablets, phones or computers. Traditional digital signage is displayed on a few monitors located throughout a school, but in today’s world most people including students get their information from mobile devices such as smartphones and tablets. Arreya’s modern design and deployment tools are purpose built to deliver your message to any device that can pull up a browser, by simply sharing a URL on your website, social media, beacons to name a few. School use to be a safe place for children. I would drop them off in the morning and feel confident they were okay during the day and learning. With all the insecurity of school safety, it gives piece of mind to know what is happening at schools. Arreya allows parents to be informed through instant updates. School staff can pre-schedule content, add an instant alert, use RSS feeds and marquee messaging, or add a twitter feed directly to their Arreya channel. No waiting for updates, every update is automatically deployed live. School or school district staff can even upload photos directly from their phones. Not all digital signage for schools is created equal. Many make claims to be easy, but rarely is that the case without sacrificing flexibility or cost. With the advent of Arreya Channel based content a school can create an unlimited amount of content of all types such as, calendar of events, broadcast morning announcements both slides and video, and daily lunch menus and live stream sports, plays and concerts anywhere in the world just to scratch the surface. Districts have another tool at their disposal it is called the administrative channel. The administrative channel is an overarching channel that manages all of the other channels within a district, content relevant to all schools can be displayed on all channels without the need to add content to each individual channel simply by using our hierarchy of content this information can be weather related closures, events, ballot initiatives or emergency notifications. The hierarchy of content will allow the individual schools to independently create content on their specific channel as they desire and but not allow them access to other schools content. Creating content is very easy and Arreya includes flexible content templates for the design challenged or a full free form option for those who choose, in both cases full support is included along with onboarding personal tutorials that are recorded for later review, knowledge base and YouTube tutorials that are constantly updated. The last part is connecting your content to monitors within the school is very simple using chrome devices such as a Asus Chromebit, the devices are simple to set up into kiosk mode with chrome management or they can come preconfigured from many vendors including Arreya for a fee. Once you have the device simply plug it into an available HDMI port and a power source and your done. One of the hardest challenges of school administrators is to motivate students to want to do better. Keeping students motivated from any demographic is a bigger challenge with inner city schools where school populations can be very diverse through income levels, race, nationality and intellectual levels. One thing all students have in common, is enjoying being recognized for doing something well or better than the other students. This is an easy way to get their attention. Take photos of individual students getting a certificate or achievement award and instantly post to an individual school digital signage or across the school district. Students will begin to do better so they can also be recognized on the school’s digital signage. Spotlighting achievements and building confidence through a student population. Increasing graduation rates, school rankings and increasing engagement in all demographics. Streamlining the management of the school’s communications means staff can spend their time interacting with students and teaching. What a novel concept – doing what you were hired to do! There is still time associated with keeping content current, but the easy to use intuitive Arreya digital signage service gives you many ways to do the same thing. You pick what design program you want to work in. Comfortable with Adobe products or Microsoft products, no problem. Arreya accepts all of them or design directly in Arreya using the Arreya Creative Studio. I used to watch as school staff would spend their time writing cafeteria menus or school schedules on white boards in hopes that students would pass by them early enough in the day to see them. Everyday, valuable time would be used to update the daily information. With Arreya digital signage pre-schedule content to post when you want for as long as you want. Completely different presentations can be scheduled for weekend or nightly events, or to welcome student groups. Complete updates in advance when time is readily available. No morning rush to get critical school or school district information updated. No need for principals to come in earlier than usual to update information. Changes to content can be made from any computer by logging into the secure online subscription. Because Arreya is completely cloud-based, there is no software to download onto a designated computer. Updates are free and automatically roll to subscriptions. The schools my children attended have a historical past that was interesting to learn. Other than signage in the hall, it was difficult to read about the past of the school or the school district. Many parents want to know the sports statistics or school rankings when deciding on a particular school. This is especially true of private schools who base their income on tuition. They have to sell the parents on sending their children to the school. Arreya digital signage is the perfect edtech platform to highlight the school achievements. The school’s Arreya channel can be shared with parents to review at home or along with a tour of the facilities. School history or Athletic Hall of Fame can be on it’s own Arreya channel within the school. Interactive content can make it easy to navigate between decades or themes. Static content can be added for a complete display. My children were very involved in school activities and so I was involved in school activities. Each activity was branded with the school logos. School spirit is a huge part of schools and bringing together student populations. Mascots, logos and overall school and school district branding distinguish systems. Huge revenue is generated for the school district through sales of school spirit wear. Add a store to your Arreya digital signage, allow people to order spirit wear right from your digital signage or add a QR code or link for people to access your school edtech store. It is easy to add school spirit to Arreya digital signage. Upload logos, design with school colors, type in school slogans and add even brand with school district branding. Digital signage for school district and edtech change the future of schools and school districts. How they interact with students, parents and faculty has changed significantly and people are used to getting information wherever they are at the moment through smart phones, tablets and other digital media. Arreya makes it easy for school districts to manage and deploy digital signage to all the schools while saving time and money. There really isn’t a negative to using digital signage for schools, the real question is why not now?